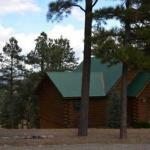 Situated in Pagosa Springs this holiday home features a barbecue. Guests benefit from balcony. The kitchen has a dishwasher an oven and a microwave as well as a coffee machine. A TV with cable channels as well as a CD player are provided. Other facilities at Maverick Hideaway Home include a fitness centre. The nearest airport is Durango-La Plata County Airport 68 km from Maverick Hideaway Home.